Paul Berriff first picked up a camera as a boy in Leeds at the end of the 1950's and by the age of 16 he was a young press photographer for the Yorkshire Evening Post. It was now 1963 and a wave of bands and artists were emerging onto the burgeoning sixties music scene. Paul was tasked with taking photographs of these musicians as they came to perform at venues across the Yorkshire region at the start of their careers. Many would go onto be famous names and the photographs were the creation of what is now known as Paul Berriff's 'Rock Legends' series. 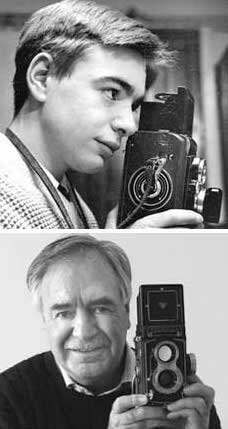 As local TV news stations emerged, Paul made the switch from stills to movie images and in 1967 he became the youngest film cameraman employed by BBC TV News in Leeds. Later Paul would join the BBC Current Affairs unit working on Panorama and Nationwide. He went on to become one of Britain's most accomplished televison documentary makers having filmed, produced and directed over 180 prime time major network documentary films. His award winning career includes two BAFTA awards and subjects of his documentaries have included such luminaries as Prince Charles, learning to fly helicopters with the RAF, Sir Roger Moore, on the set of James Bond, and an expedition with Sir Ranulph Fiennes. Incident has never been far away from Paul's filming career and he has survived volcanic explosions, sinking boats and a helicopter crash. On the fateful morning of 11th September 2001, Paul was filming a series of Animal Precinct in downtown New York when the first plane flew overhead and into the Twin Towers, which was only a short distance away. He raced to the scene with his sound recordist and was given permission to film the FDNY’s Deputy Chief Fire Commissioner co-ordinating the rescue operation. When the South Tower began to collapse Paul continued to film for as long as he could before he was knocked to ground. Paul and his colleague survived but he lay unconscious for 25 minutes in the debris before managing to crawl out. His camera was smashed but his tape showing the iconic sequences of the tower collapsing survived and these images were shown by media outlets around the world. A few months later Paul returned to New York to film a documentary charting the aftermath of the attack from the point of view of the three surviving firefighters who were alongside him when the South Tower collapsed. 9/11: The Firefighters' Story was broadcast in the UK on Channel 5 and in 12 other countries in 2002. This 60-minute film, highly acclaimed by TV critics was selected by the New York Fire Department as the film that most depicted the impact of that day on NY firefighters. It is shown to all new recruits at the NY Fire Academy. During a break from filming Paul was moving house where he now lives in Bedale, North Yorkshire when he rediscovered the negatives from his sixties rock photographs which had been forgotten in his attic for over 40 years! Lovingly restored Paul realised he had a fantastic collection of iconic images and his 'Rock Legends' series and The Beatles Hidden Gallery collections were born. They have since been exhibited at Carnegie Hall in New York, San Francisco Museum of Science, San Francisco Art Exchange, Memphis Rock 'n' Soul Museum, Prague Museum of Music and Harvey Nichols in Dubai.